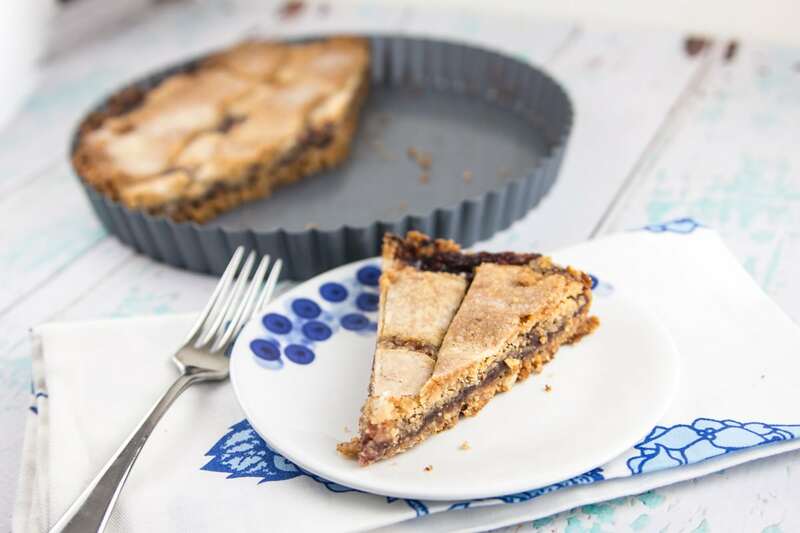 This gluten free linzer tart uses a nut based crust, a raspberry jam filling, and is one of the best things you’ll ever make – gluten free or not. For those you who celebrate, I hope everyone had an enjoyable weekend of Passover (or Easter). We’re about halfway through Passover today, which probably means that you’re finishing up the leftovers of the desserts you made for Seder. Seder dinners are always big feasts, with lots of food, but the remaining 6 nights tend to turn into a mishmash of unplanned things thrown together at the last minute. 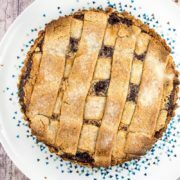 Why not make the last night equally special and make this gluten free linzer tart for dessert on Friday night? But make no mistake – this isn’t just for Passover. This is year-round worthy. Birthday? Yes. Thanksgiving? Yes, yes (feel free to use cornstarch instead of potato starch). 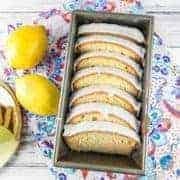 Anytime you need a gluten free dessert? Yes, yes, yes! Last week, I shared a flourless chocolate ganache cake that I made for Friday night’s Seder with our neighbors. When it came time to plan out the desserts for Saturday’s family Seder, I couldn’t resist going back to my personal wheelhouse when it comes to desserts – fruit based. I have a very tiny target audience when it comes to others who like fruit: basically, my father. My husband and his entire family are all about chocolate or cheesecakes. His friends always want something that combines chocolate with peanut butter or oreos. My coworkers are the biggest bunch of chocoholics I’ve encountered. So when my father comes to town, I can’t resist making something that I know we’ll both enjoy. 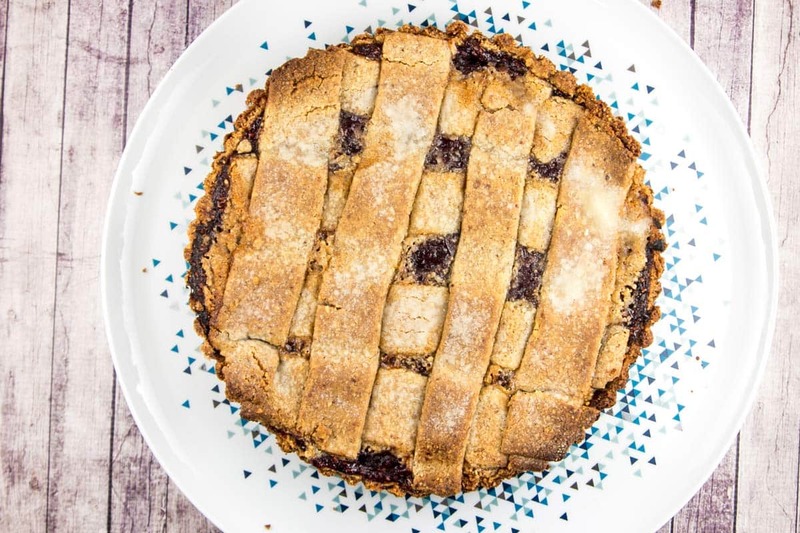 This year, it was a gluten free linzer tart: a perfectly crunchy crust, made from a combination of ground almonds, walnuts, and hazelnuts, spread with a thick layer of raspberry jam. I’ve never attempted a crust based so heavily on nuts and wasn’t sure how it would work out. The dough was surprisingly easy to work with, baked up beautifully, and cut cleaner than many flour-filled pie and tart dough recipes I’ve used in the past. And most importantly, the finished tart is delicious. I’d never expect something I made specifically for Passover to wind up as one of my favorite things I’ve made, but it really is that good. I definitely won’t be waiting until next Passover to make this again! 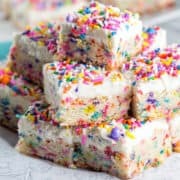 It’s a little more work than some other desserts. It’s not quite the same one bowl, one whisk ease as the chocolate ganache cake. But let me assure you, it’s well worth the effort. The dough is a little fragile, but I found that I could patch it together easily if it started to tear. I made mine with butter, but if you’re serving meat for your Passover dinner, use margarine instead. I also ground my own nuts for this – you can use any combination of nuts, totaling 3 cups after grinding. The best way to achieve the right texture is with lots of very brief pulses with small batches of nuts. I made three separate batches in my food processor, and each took maybe 100 half-second pulses. It’s better to err on the side of not-quite-fine-enough than going too far into the nut butter stage! 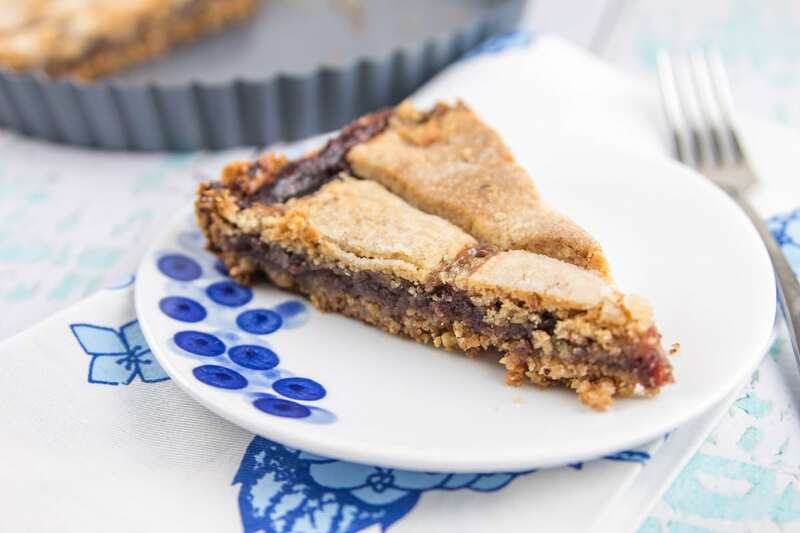 This gluten-free linzer tart uses a nut based crust, a raspberry jam filling, and is one of the best things you’ll ever make. If your nuts aren’t pre-ground, grind them in a food processor using a series of very short pulses. The nuts should be finely ground, but not ground to the point that they are smooth and buttery. Using an electric mixer on high speed, beat the butter until soft. Add the ground nuts, potato starch, and granulated sugar; mix until well combined. Add a little more than half of this dough to a 9” tart pan, pressing the dough into the bottom of the pan and up the sides, creating a roughly 1/3-inch crust. Use your fingers to push the dough up the sides and your palms to flatten the dough into the bottom of the pan. Put the pan in the freezer for 45 minutes. 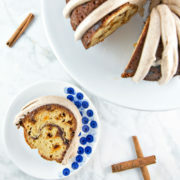 Add the confectioners’ sugar to the dough remaining in the bowl and mix it in. Shape the dough into a ball, wrap in plastic wrap, and chill the dough in the refrigerator for 30 – 45 minutes. 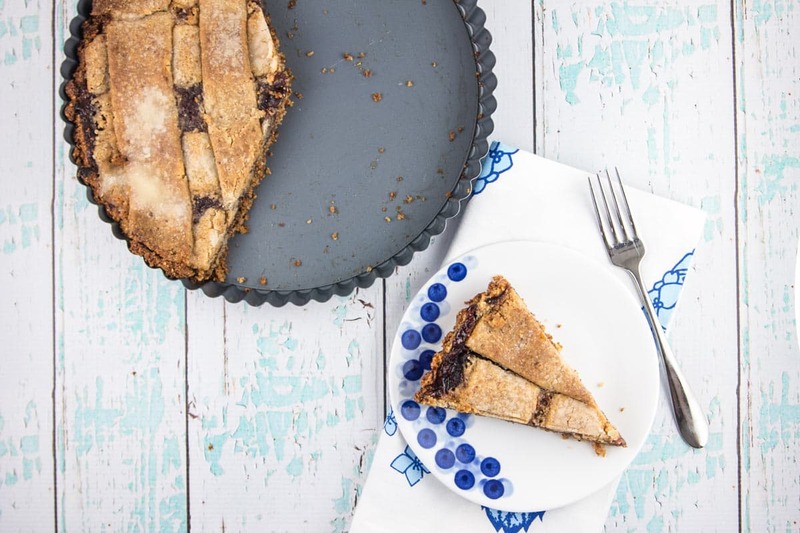 Remove the tart pan from the freezer and place it on top of a cookie sheet. Bake the dough for 15 minutes in a 375F oven, until the crust starts to bubble up a bit and turn golden in color. Remove the cookie sheet from the oven, slide the tart pan off the cookie sheet, and allow the crust to cool for 10 minutes. Spread 1 cup of the jam evenly over the bottom of the crust, using a silicone spatula. Remove the dough from the refrigerator and roll it out between two sheets of parchment paper. Roll the dough into a 10” square, roughly 1/3-inch thick. Using a knife or pizza cutter, cut the dough into 8 3/4” to 1”-thick strips. Using a large spatula or dough scraper, carefully lift each strip individually and place them across the top of the jam-filled crust to create a lattice. I was able to do this with the room-temperature dough if I worked carefully and slowly, but if your dough is tearing too much, freeze the strips for 10 minutes first. Don’t try to weave the strips into an over-and-under lattice; it’s too fragile. Instead, just place 4 strips going in one direction, and the other 4 strips on top in the other direction. Trim the ends of the dough and tuck them into the border of the bottom crust. Sprinkle the remaining 1 tablespoon of granulated sugar on top of the tart. Bake for 35 to 40 minutes, until the jam is bubbling and the crust is golden brown. Serve warm or at room temperature.